I have noticed that there is a slightly updated version of this pen on the Sharpie website, I think I may prefer the newer barrel design, but I don’t think there’s going to be enough in it for me to get one just yet. 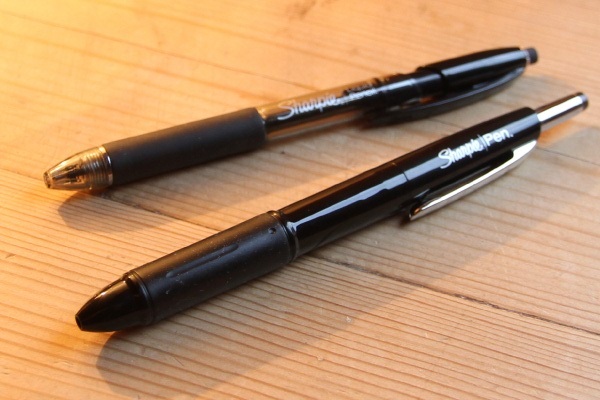 The Sharpie Liquid Pencil (which I believe may now be discontinued) uses a liquid graphite ‘ink’, which writes like a pen, but is erasable like a pencil. The idea is that you’ll no longer have any broken leads, or something. I think the idea is just to reinvent a classic in a whole new way. A bit like technology… for the sake of technology. I’m so glad I have this pencil – the idea is very cool, even though the execution is a little off. Unfortunately the lines come out blotchy and not very consistent… but bonus points are given because of the cool technology inside. Though the truth is that I always gravitate back to my real mechanical pencil after using the Sharpie Liquid Pencil a short amount of time. Above all, Stanford has shown us that Sharpie is capable of being much more than just a marker. They have probably played a slightly safer move by adding these risky and experimental products to a brand that is seen as cool by the younger generations anyway, and as far as I’m concerned they can keep doing this – even if the product doesn’t turn out as well as hoped. I think this is especially important for an American brand, as the Japanese seem to excel at this naturally. While the Sharpie Pen started out well, the more I’ve used it the less I’ve liked the barrel. It’s too fat and and the rubber grip is too solid to be worth having. The ink is still very good though!